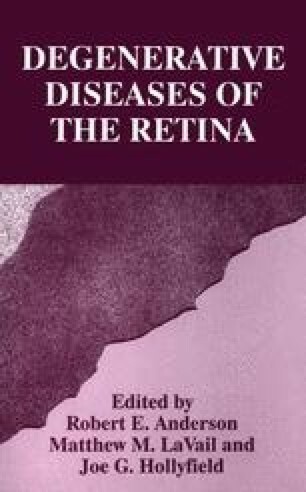 Retinitis pigmentosa (RP) is a group of inherited retinal diseases characterized by progressive death of photoreceptors. Photoreceptor death in several rodent models of human RP was recently demonstrated to involve apoptosis. We sought to determine if photoreceptor death occurs by apoptosis in retinas from patients with RP. Donor retinas were screened using two labeling methods for in situ demonstration of fragmented nuclear DNA, a hallmark of apoptosis. To improve the sampling, portions of the retinas were processed as flat mounts. We examined 15 retinas from patients (age 24 to 87 yrs) who had different genetic forms of RP and retained photoreceptors at the time of death, as well as seven retinas from normal donors (age 19 to 68 yrs). Scattered labeled nuclei were present in the retinas from two RP donors who were 24 and 29 yrs old at the time of death. Labeled nuclei were not found in the normal retinas or in the retinas from the older RP donors. This study provides initial evidence that photoreceptor death in human RP occurs by apoptosis, as found previously in the rodent inherited retinal dystrophies. Apoptosis is a relatively rapid process in other types of cells, and it may be difficult to demonstrate in human RP retinas, where photoreceptor death is protracted over several decades. In addition, the likelihood of documenting this rather brief event in the retinas of older RP donors is small because they contain greatly reduced numbers of photoreceptors. Photoreceptor dysfunction results from several different gene defects in animal models and RP patients, but photoreceptor death in each case appears to occur by the final common pathway of apoptosis. Agents to inhibit apoptosis warrant evaluation as new therapy for inherited photoreceptor diseases.